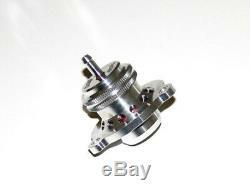 Vauxhall Opel Astra J GTC 1.4T Forge Blow Off Valve Kit - PN: FMDVCS14A. This is a piston design bypass valve that is a direct replacement for the original fitment. This valve gives greater longevity than the diaphragm (OEM) valves but also benefits from its ability to be fitted with different springs when the boost pressure has been increased or the engine has been modified. Please Note: To avoid the possibility of a P0101 trouble code, the ECM must be reprogrammed with a tune optimised for atmospheric discharge. 1 x Uprated Yellow Spring. Forge Motorsport was founded in 1994 with the simple ideals of innovation, clever design, and manufacturing to the highest quality. Their mantra is the BEST customer care and after service worldwide. In doing this they have developed the largest range of replacement aftermarket blow off / recirculation valves, intercoolers and actuators in the world. We try to respond to messages within 24 hours. If you do not receive a response within 24 hours please send us another message. Please be aware that some of our items are made to order and can carry up to a 14 day lead time. Information on lead times for all made to order items will be included in the Product Description. Upon receipt of your order you will be asked to sign for the goods received in good condition. The item "Vauxhall Opel Astra J GTC 1.4T Forge Blow Off Valve Kit PN FMDVCS14A" is in sale since Wednesday, May 16, 2018. This item is in the category "Vehicle Parts & Accessories\Car Tuning & Styling\Engine, Tuning & Chips\Other Engine Tuning". The seller is "wg_motorparts" and is located in Rochester. This item can be shipped to North, South, or Latin America, all countries in Europe, all countries in continental Asia, Australia, New Zealand.